This article is about the city since 1945. For detailed history before 1945, see Königsberg. For other uses, see Kaliningrad (disambiguation). Kaliningrad (Russian: Калининград, IPA: [kəlʲɪnʲɪnˈɡrat]) is a city in the administrative centre of Kaliningrad Oblast, a Russian exclave between Poland and Lithuania on the Baltic Sea. In the Middle Ages it was the site of the Old Prussian settlement Twangste. In 1255, during the Northern Crusades, a new fortress named Königsberg was built by the Teutonic Knights. Königsberg became the capital of the Duchy of Prussia, a fiefdom of Poland from 1525 to 1657, and later East Prussia, Germany. It was heavily damaged during World War II, and its population fled or were removed by force. Königsberg became a Russian city, renamed Kaliningrad in 1946. At the 2010 Census, Kaliningrad's population was 431,902. Königsberg was preceded by a Sambian (Old Prussian) fort called Twangste (Tuwangste or Tvankste), meaning Oak Forest. During the conquest of the Sambians by the Teutonic Knights in 1255, Twangste was destroyed and replaced with a new fortress named Königsberg. The declining Old Prussian culture finally became extinct around the 17th century, after the surviving Old Prussians were integrated through assimilation and Germanization. The settlement at the site of the present day Kaliningrad was founded as a military fortress in 1255 after the Prussian Crusade by the Teutonic Knights against Baltic Prussians, a non-Germanic ethnic group related to the ancestors of the present-day Lithuanians and Latvians. The new town was named in honor of the Bohemian King Ottokar II. The crusade was followed by immigration from Germany and other regions of Western Europe. Within the following seven centuries, the area became predominantly German, with Polish and Lithuanian minorities. During World War II the city of Königsberg was heavily damaged by a British bombing attack in 1944 and the massive Soviet siege in spring 1945. The U.S. President Harry Truman and the British Prime Minister Clement Attlee declared that they would support the proposal of the Conference at the forthcoming peace settlement. On 4 July 1946 the Soviet authorities renamed Königsberg to Kaliningrad following the death on 3 June 1946 of the Chairman of the Presidium of the Supreme Soviet (titular head of state) of the USSR, Mikhail Kalinin, one of the original Bolsheviks. The survivors of the German population were forcibly expelled in 1946–1949, and the city was repopulated with Soviet citizens. The city's language of administration was changed from German to Russian. The city was rebuilt, and as the westernmost territory of the USSR, the Kaliningrad Oblast became a strategically important area during the Cold War. The Soviet Baltic Fleet was headquartered in the city in the 1950s. Because of its strategic importance, Kaliningrad Oblast was closed to foreign visitors. The town of Baltiysk, just outside Kaliningrad, is the only Russian Baltic Sea port said to be "ice-free" all year round, and the region hence plays an important role in maintenance of the Baltic Fleet. While in the 1990s many Soviet-era city names commemorating Communist leaders were changed (e.g. Leningrad reverting to Saint Petersburg), Kaliningrad remains named as it was. 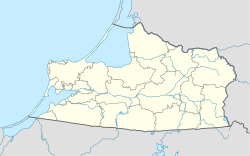 Since the early 1990s, the Kaliningrad oblast has been a Free Economic Zone (FEZ Yantar). 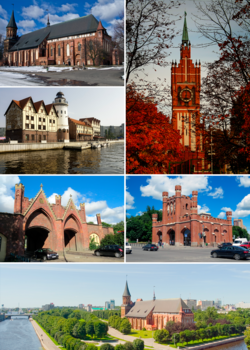 In 2005 the city marked 750 years of existence as Königsberg/Kaliningrad. In July 2007, Russian First Deputy Prime Minister Sergei Ivanov declared that if US-controlled missile defense systems were deployed in Poland, then nuclear weapons might be deployed in Kaliningrad. On November 5, 2008, Russian leader Dmitry Medvedev said that installing missiles in Kaliningrad was almost a certainty. These plans were suspended, however, in January 2009. But during late 2011, a long range Voronezh radar was commissioned to monitor missile launches within about 6,000 kilometres (3,728 miles). It is situated in the settlement of Pionersky (formerly German Neukuhren) in Kaliningrad Oblast. Even though the current German government has stated it has no claim over Kaliningrad, the former Königsberg, the possibility of such a return to German rule at some future time continues to come up in discussion, creating what is known as "The Kaliningrad question". In 2018, Kaliningrad hosted some games of the World Cup. Kaliningrad is the administrative centre of the oblast. Within the framework of administrative divisions, it is incorporated as the city of oblast significance of Kaliningrad—an administrative unit with the status equal to that of the districts. As a municipal division, the city of oblast significance of Kaliningrad is incorporated as Kaliningrad Urban Okrug. Kaliningrad has many museums. 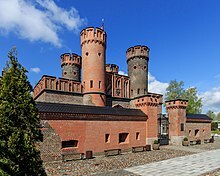 A few examples are the Immanuel Kant museum on the Kneiphof island, the Regional Museum of History and Arts, which has parts of Königsberg Castle's Prussia Museum of local archaeological findings, and the Kaliningrad Amber Museum, which is situated in the Dohna Tower near the Rossgarten Gate. The city is also home to the Kaliningrad State Art Gallery, established in 1988, that is developing as a contemporary art museum. The Museum of the World's Oceans is located on the former research vessel Wityaz on the shore of the Pregel river. The museum displays the newest technologies on sea research and also shows the diversity of the flora and fauna of the world's oceans. An anchored Foxtrot-class submarine next to the museum, the B-413, hosts an exhibit about the Russian submarine fleet. The Kaliningrad Philharmonic Orchestra is accommodated in the former Catholic Church of the Holy Family of Königsberg, built in 1907. The church escaped major damage in World War II and was refurbished afterwards. The building, which has noted acoustics, functions as an organ hall since re-opening in 1980. 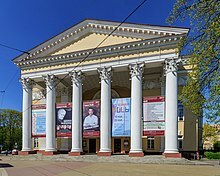 The Kaliningrad Regional Drama Theatre is located in the former Königsberg Neues Schauspielhaus, which was opened in 1910. The building was rebuilt after the war using earlier plans for the theatre and opened in 1960. The colonnade in front of the entrance was modeled after the Bolshoi Theatre in Moscow. The regionally notable Kaliningrad Puppet Theatre has had its seat since 1975 in the Queen Louise Remembrance Church. This neo-romantic church, designed by architect Fritz Heitmann, was built in 1901. The pre-war city center (Altstadt and Kneiphof) currently consists of parks, broad avenues, a square on the site of the former Königsberg Castle, and two buildings: the House of Soviets ("Dom Sovyetov"), roughly on the site of the former castle, and the restored Königsberg Cathedral on the Kneiphof island (now "Kant island"). Immanuel Kant's grave is situated next to the cathedral. Many German-era buildings in the historic city center have been preserved and even rebuilt, including the reconstruction of the Königsberg Synagogue. The new city center is concentrated around Victory Square. The Cathedral of Christ the Savior, consecrated in 2005, is located on that square. The oldest building in Kaliningrad is the Juditten Church (built before 1288). Also worth seeing are the former Stock Exchange, the surviving churches, and the remaining city gates. 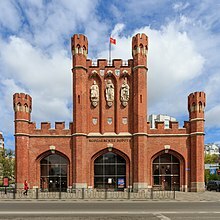 In counter-clockwise order these gates are: the Sackheim Gate, King's Gate, Rossgarten Gate, Attack Gate (German: Ausfallstor, or Sally Port), Railway Gate (Eisenbahntor), Brandenburg Gate, and Friedland Gate (Friedländer Tor (Kaliningrad) [de]). Apart from the already mentioned Dohna Tower, which houses the Amber Museum, the Wrangel Tower also remains as a reminder of the former Königsberg city walls. Only the gate of the former Fort Friedrichsburg remains. Notable monuments include the statue of Immanuel Kant in front of the Immanuel Kant State University of Russia. The statue was made by notable sculptor Christian Daniel Rauch and unveiled in 1864. The statue was destroyed in 1945, but was remoulded in 1992 on the initiative of Marion Dönhoff, a native East Prussian who became prominent in the West. Also worth seeing is the Cosmonaut monument, which honours the Kaliningrad cosmonauts Alexei Leonov, Yuri Romanenko and Aleksandr Viktorenko. Other statues and monuments include the statue for Duke Albert, the statue for Friedrich Schiller, the statue for Tsar Peter the Great, Vladimir Vysotsky, the "Mother Russia" monument, and the Monument for the 1200 Guardsmen, remembering the Battle of Königsberg. Kaliningrad is a very "green" city with a large number of parks and areas with lots of trees and lawns. Parks range from tiny city squares to massive parks. Youth Recreation Park is one of the well known and popular parks in the city. The park was established in the '20s-'30s in the English style. It reopened its doors post war and was popular among citizens in the '80s-'90s with its beautiful boat house and tennis courts, as well as merry-go-rounds. The park had a massive reconstruction in 2004 adding to the park a cafe, carting, and various modern entertainments. It is located in the quiet area of the city, in Leningradsky area, and is connected to the Lower Pond. Youth Recreation Park provides entertainment for all age groups. There is also Interpersonal Communications Development Central located in the park. Its beautiful building became a popular backdrop for wedding pictures. The Kaliningrad Zoo was opened as the Königsberg Zoo in 1896. The collection, which extends over 16.5 ha, comprises 315 species with a total of 2,264 individual animals (as of 2005[update]). The Kaliningrad Zoo is also an arboretum. Centrally located in the city is Lower Pond, an artificial lake. Lower Pond is surrounded by a promenade and is an area for recreation especially in summer. North of the Lower Pond is the larger Upper Pond in northern Kaliningrad. Leonhard Euler's 1736 paper on the puzzle of the Seven Bridges of Königsberg was a seminal work in the fields of graph theory and topology. Only two of the structures from his era survive. In 2018, a new stadium, Kaliningrad Arena, was built on the Oktyabsrky Island, near the embankment of the Staraya Pregolya River. The stadium has a seating capacity of 35,000. Kaliningrad is at the mouth of the navigable Pregolya River, which empties into the Vistula Lagoon, an inlet of the Baltic Sea. Until around 1900, ships drawing more than 2 meters (6 ft 7 in) of water could not pass the bar and come into town; larger vessels had to anchor at Pillau (now Baltiysk), where cargo was transferred to smaller vessels. In 1901, a ship canal between Königsberg and Pillau, completed at a cost of 13 million German marks, enabled vessels of a 6.5 meters (21 ft) draught to moor alongside the town (see also Ports of the Baltic Sea). Kaliningrad has a humid continental climate (Dfb or Cfb, depending on the isotherm chosen for class C climates), with cold, cloudy, (though moderate compared to most of Russia) winters and mild summers with frequent showers and thunderstorms. Average temperatures range from −1.5 to +18.1 °C (29.3 to 64.6 °F) and rainfall varies from 36.0 millimeters (1.42 in)/month to 97.0 millimeters (3.82 in)/month. In general, it has maritime climate influences and therefore damp, variable and mild, with vast temperature differences between July and January. The seasons are clearly differentiated. Spring starts in March and is initially cold and windy, later becoming pleasantly warm and often very sunny. Summer, which begins in June, is predominantly warm but hot at times (with temperature reaching as high as +30–+35 °C (86–95 °F) at least once per year) with plenty of sunshine interspersed with heavy rain. The average annual hours of sunshine for Kaliningrad are 1700, similar to other northern cities. Autumn comes in September and is at first warm and usually sunny, turning cold, damp and foggy in November. Winter includes periods of snow. January and February are the coldest months with the temperature sometimes dropping as low as −15 °C (5 °F). An important education centre in Kaliningrad is the Immanuel Kant Baltic Federal University. It is the successor to the Albertina, which was the old university of Königsberg founded in 1544, and whose faculty included noted scholars as Abraomas Kulvietis, Stanislovas Rapalionis, Immanuel Kant, and Jan Mikulicz-Radecki. 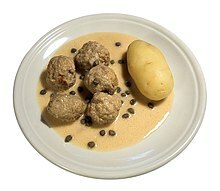 Königsberger Klopse are a Prussian specialty of meatballs in a white sauce with capers that can be found in many restaurants in Kaliningrad. Kaliningrad has its own vodka and beer brands, Stari Königsberg and Ostmark respectively. Since the early 1990s many new restaurants have opened in the city. These restaurants offer culinary specialities of former East Prussia, like Königsberger Klopse, but also many fish and salad dishes, Italian pizza and sushi, which is as popular in Kaliningrad as in the rest of Russia. Königsberger Fleck, a bovine tripe soup and yet another culinary specialty from former Königsberg, no longer belongs to the culinary culture of Kaliningrad. The people of Kaliningrad generally imported their respective culinary traditions to the region when they settled in the area after 1945. Borshch and okroshka may be served as in the rest of Russia. Many Italian and Asian restaurants (or fusions of both traditions) are in operation all over the city. Pizza and sushi are among the most popular dishes today. Fast food is widely available from various chains, including those of foreign origin. Shawarma is also gaining considerable prominence. Khrabrovo Airport, 24 kilometers (15 mi) north of Kaliningrad, has scheduled and charter services to several destinations throughout Europe. There is the smaller Kaliningrad Devau Airport for general aviation. Kaliningrad is also home to Kaliningrad Chkalovsk naval air base. In Baltiysk, one can take a ferry to St. Petersburg, Stockholm, Copenhagen, Riga, and Kiel. Kaliningrad's international railway station is Kaliningrad Passazhirsky, which in German times was known as Königsberg Hauptbahnhof. Trains depart in the directions of Moscow, Saint Petersburg, Adler and Chelyabinsk. A unique feature of the Kaliningrad railway is that some tracks in the direction of Poland and Berlin have a standard gauge track parallel to the Russian broad gauge of 1520 mm, used mostly for strategic reasons during the Cold War and nowadays for goods traffic. Platform number 6 at the Passazhirsky station can be reached on standard gauge over the former Ostbahn main line from Elbing (Elbląg) making passenger through traffic from Berlin possible. Regional trains also depart from Kaliningrad-North, the former Königsberg Nordbahnhof, which is situated on Victory Square, the current city center. Trains depart to Zelenogradsk and Svetlogorsk, and also once a day to Sovetsk. The lines to the Zelenogradsk and Svetlogorsk have been electrified. Many local pre-war lines have been broken up or are no longer in use, because the new border with Poland disrupted the former traffic flows. In 1881, the Königsberg tramway system was opened, and it still functions to this day. In 1975, a trolleybus system was also introduced. In 1996, Kaliningrad was designated a Special Economic Zone, referred to as FEZ Yantar. Manufacturers based there get tax and customs duty breaks on the goods they send to other parts of Russia. Although corruption was an early deterrent, that policy means the region is now a manufacturing hub. One in three televisions in Russia is made in Kaliningrad (including Ericsson brand by Telebalt Ltd. and Polar by an eponymous firm located in the city of Chernyakhovsk) and it is home to Cadillac and BMW related car plants (produced by Avtotor). Currently, Kaliningrad's major industries are manufacturing, shipping, fishing and amber products. In 2006, Moscow declared it would turn the region into "the Russian Hong Kong". The European Commission provides funds for business projects under its special programme for Kaliningrad. With an average GDP growth of more than 10% per year for three years to 2007, Kaliningrad grew faster than any other region in Russia, even outstripping the success of its EU neighbours. By early 2015, the BBC reported the region's trade with the countries of the EU was increasing, with improved economic growth and industrial output. In preparation for the 2018 FIFA World Cup, 4 new hotels have been built in the city, including a five star apartment hotel, Crystal House. Kaliningrad Oblast used to be the most heavily militarized area of what is now the Russian Federation, and the density of military infrastructure was the highest in Europe. It was the headquarters of the former Soviet Baltic Military District. Kaliningrad also functions as the headquarters of Russia's Baltic Fleet, ringed by Chernyakhovsk (air base), Donskoye (air base) and Kaliningrad Chkalovsk (naval air base). Access and control to the Baltic Sea was imperative because of Soviet perceptions that this meant that the hegemonic power had "influence on European and global affairs". Russia had replaced Sweden as the hegemon since the 18th century, but during the late 19th and early 20th century it was increasingly ousted by Germany's growing naval power. At any point in time during the Soviet era, there would be at least 100,000 troops stationed in Kaliningrad (though there are some estimates that run up to 300,000). Therefore, the population of the city was fluid and almost always temporary. Many military officers and their families would refer to the Kaliningrad Oblast as "the West". The Soviet Union also kept nuclear weapons for use in case a war occurred. The original German population fled or was expelled at the end of World War II when the territory was annexed by the Soviet Union. In October 1945, only about 5,000 Soviet civilians lived in the territory. Between October 1947 and October 1948, about 100,000 Germans were forcibly moved to Germany. By 1948, about 400,000 Soviet civilians arrived in the Oblast. Today the overwhelming majority Kaliningrad's residents are of Russian ethnicity settled after 1945. A minority of the population are from other Slavic people. Kaliningrad today is home to communities of Ukrainian, Belarusian, Tatar, German, Armenian, Polish, and Lithuanian. In the 1940s and 1950s the Soviets resettled Poles from Belarus, the Baltic states, Ukraine, and Russia to Kaliningrad. According to Wacław Podbereski after the Second World War and the takeover of the administration in these areas by the Soviets, the development of the Polish element in this region effectively ceased. The oldest church in Königsberg was the Polish church of St. Nicholas, which had been founded with the city in 1255 in the historic district of Steindamm. It had Polish-language services until 1901. Change came with the disintegration of the Soviet Union, due mainly to pastoral activities that began the repopulation of the Poles in Russia. The first steps were made by a Polish priest from Grodno (Hrodna), Jerzy Steckiewicz. The "Polish Cultural Community in Kaliningrad" operates as the main Polish organization among Kaliningrad's Polonia, one of six such Polish organizations within Kaliningrad Oblast. Wspolnota Polska estimates that it is likely there are between 15,000 and 20,000 Poles living in the entire oblast. The "Polish Cultural Community in Kaliningrad" organizes poetry contests and is the publisher of the local Polish-language newspaper The Voice from the Pregel. The whole Kaliningrad Oblast has witnessed an increase in Polish cultural activity since the fall of the Soviet Union, partly due to the immigration of Polish families from Kazakhstan, who had been deported by Stalin during the Soviet invasion of Poland in 1939. Kaliningrad is home to the football club FC Baltika Kaliningrad, which plays in the Football Championship of the National League (formerly Russian First Division). It played in the Russian Premier League for 3 seasons between 1996 and 1998. Kaliningrad was the host of some games in the 2018 FIFA World Cup. In 2004, Germany opened a consulate general in Kaliningrad. This consulate allows Kaliningrad residents to get Schengen visas without having to travel to Moscow. An agreement between Gerhard Schröder, Chancellor of Germany, and President of Russia Vladimir Putin established the consulate in light of Lithuania and Poland, which surround Kaliningrad, joining the EU. Russian concerns with Germany wanting the former Königsberg back had stifled earlier plans for a German consulate. Poland and the Russian Federation have an arrangement whereby residents of Kaliningrad and the Polish cities of Olsztyn, Elbląg and Gdańsk may obtain special cards permitting repeated travel between the two countries, crossing the Polish–Russian border. As of July 2013, Poland had issued 100,000 of the cards. That year, Russians visiting Poland to shop at the Biedronka and Lidl supermarkets featured in songs by musical group Parovoz. ^ Article 6 of the Charter of Kaliningrad states that the city may have an anthem, providing one is officially adopted. As of 2015[update], an anthem is not listed among the symbols of the city shown on the official website of Kaliningrad. ^ The Monthly Review. R. Griffiths. 1836. p. 609. Retrieved December 29, 2014. ^ "The Potsdam Declaration". ibiblio.org. Retrieved December 29, 2014. ^ "Russia (USSR) / Poland Treaty (with annexed maps) concerning the Demarcation of the Existing Soviet-Polish State Frontier in the Sector Adjoining the Baltic Sea 5 March 1957" (PDF). un.org. Retrieved December 29, 2014. ^ For other issues of the frontier delimitation see "Maritime boundary delimitation agreements and other material". un.org. Retrieved December 29, 2014. ^ "The New York Times". nytimes.com. Retrieved December 29, 2014. ^ Luke Harding in Moscow (January 28, 2009). ""Russia scraps plans to deploy nuclear-capable missiles in Kaliningrad" The". Guardian. Retrieved December 21, 2013. ^ 28.11.2011 (November 28, 2011). ""Russia's new radar to monitor all Europe including Britain" Pravda 28.11.2011". English.pravda.ru. Retrieved December 21, 2013. ^ "Kaliningrad State Art Gallery". www.russianmuseums.info. 2014. Retrieved June 21, 2014. ^ "Новости! Анонсы! Акции! | Парк "Юность", г.Калининград". www.park-unost.ru. Retrieved August 18, 2017. ^ "Weather and Climate-The Climate of Kaliningrad" (in Russian). Погода и климат. Retrieved April 5, 2016. ^ "Kaliningrad Climate Normals 1961–1990". National Oceanic and Atmospheric Administration. Retrieved April 5, 2016. ^ "Russia's Daily Online". Kommersant. Archived from the original on August 31, 2009. Retrieved June 27, 2009. ^ "Shostakovich & Schnittke Concertos". Classicstoday.com. Retrieved January 31, 2014. ^ Sheeter, Laura (October 16, 2006). "'Kaliningrad erases stains of past' 16 October 2006". BBC News. Retrieved December 21, 2013. ^ "'Regions and territories: Kaliningrad' 18 December 2007". BBC News. October 5, 2013. Retrieved December 21, 2013. ^ Knudsen, Olav F. (1999). Stability and Security in the Baltic Sea Region. Portland, OR: Frank Cass & Co. Ltd. p. 38. ISBN 0-7146-4932-5. ^ Krickus, Richard (2002). The Kaliningrad Question. Lanham, Maryland: Rowman & Littlefield Publishers, Inc. p. 42. ^ a b Malinkin, Mary Elizabeth (February 8, 2016). "Building a Soviet City: the Transformation of Königsberg". Wilson Center. Archived from the original on July 7, 2017. Retrieved May 2, 2018. ^ Berger, Stefan (May 13, 2010). "How to be Russian with a Difference? Kaliningrad and its German Past". Geopolitics. 15 (2): 345–366. doi:10.1080/14650040903486967. ^ a b Wspólnota Polska (December 17, 2012). "Stowarzyszenie Wspólnota Polska". Archiwum.wspolnotapolska.org.pl. Retrieved March 12, 2013. ^ a b "Placówki Dyplomatyczne Rzeczypospolitej Polskiej". Kaliningradkg.polemb.net. Retrieved December 21, 2013. ^ a b "Consulate General in Kaliningrad". Kaliningradkg.polemb.net. Retrieved December 21, 2013. ^ "Consulate General of Germany in Kaliningrad, Russia." Embassypages.com. Retrieved on Feb 5, 2019. ^ "Fischer Establishes German Outpost in Kaliningrad." Deutsche Welle. 12 February 2004. Retrieved on 16 May 2016. ^ Kovalev, Vladimir. "No Building for German Consulate." The Moscow Times. August 30, 2004. Retrieved on Feb 5, 2019. ^ DW Staff (dsl). "Fischer Establishes German Outpost in Kaliningrad." Deutsche Welle. February 12, 2004. Retrieved on Feb 5, 2019. ^ A.C. (October 8, 2013). "Poland and Kaliningrad: Small Border Traffic". Economist blog. Archived from the original on October 8, 2013. Retrieved December 29, 2014. ^ a b "Города-партнёры" (in Russian). Kaliningrad City Hall. Archived from the original on April 22, 2009. Retrieved December 8, 2008. ^ Luhn, Alec (November 20, 2011). "Kaliningrad". The Moscow Times. Retrieved February 26, 2016. ^ "Kaliningrad information". E-gorod.ru. Retrieved December 21, 2013. ^ Korolczuk, Dariusz (January 12, 2010). "Foreign cooperation - Partner Cities". Białystok City Council. City Office in Białystok. Retrieved March 22, 2013. ^ "Elbląg - Podstrony / Miasta partnerskie". Elbląski Dziennik Internetowy (in Polish). Archived from the original on March 15, 2011. Retrieved December 29, 2014. ^ "Elbląg - Miasta partnerskie". Elbląg.net (in Polish). Retrieved August 1, 2013. ^ "Gdańsk Official Website: 'Miasta partnerskie'". gdansk.pl (in Polish and English). Urząd Miejski w Gdańsku. 2009. Archived from the original on July 23, 2013. Retrieved July 11, 2009. ^ P.C., Net. "Gdynia - International Gdynia - International co-operation of Gdynia". www.gdynia.pl. Archived from the original on October 19, 2016. ^ "Groningen - Partner Cities". © 2008 Gemeente Groningen, Kreupelstraat 1,9712 HW Groningen. Archived from the original on September 26, 2007. Retrieved December 8, 2008. ^ "Miasta partnerskie - Urząd Miasta Łodzi". City of Łódź (in Polish). Archived from the original on June 24, 2013. Retrieved December 29, 2014. ^ "Vänorter" (in Swedish). Malmö stad. Archived from the original on December 3, 2013. Retrieved November 6, 2013. ^ "Miasta bliźniacze Torunia" [Toruń's twin towns]. Urząd Miasta Torunia [City of Toruń Council] (in Polish). Retrieved August 22, 2013. ^ "Yerevan - Partner Cities". Yerevan Municipality Official Website. ©2005–2013 www.yerevan.am. Archived from the original on November 5, 2013. Retrieved November 4, 2013. Городской Совет депутатов Калининграда. Решение №257 от 12 июля 2007 г. «О принятии Устава городского округа "Город Калининград"», в ред. Решения №20 от 17 февраля 2017 г. «О внесении изменений и дополнений в Устав городского округа "Город Калининград", утверждённый Решением городского Совета депутатов Калининграда от 12 июля 2007 г. №257». Вступил в силу 22 июля 2007 г. (за исключением отдельных положений). Опубликован: "Гражданин" (специальный выпуск), №12, 21 июля 2007 г. (City Council of Deputies of Kaliningrad. Decision #257 of July 12, 2007 On Adopting the Charter of the Urban Okrug of the "City of Kaliningrad", as amended by the Decision #20 of February 17, 2017 On Amending and Supplementing the Charter of the Urban Okrug of the "City of Kaliningrad", Adopted by Decision #257 by the City Council of Deputies of Kaliningrad Decision on July 12, 2007. Effective as of July 22, 2007 (with the exception of certain clauses).). Калининградская областная Дума. Закон №397 от 15 мая 2004 г. «О наделении муниципального образования "Город Калининград" статусом городского округа», в ред. Закона №370 от 1 июля 2009 г «О составе территорий муниципальных образований Калининградской области». Вступил в силу со дня официального опубликования. Опубликован: "Российская газета" ("Запад России"), №115, 3 июня 2004 г. (Kaliningrad Oblast Duma. Law #397 of May 15, 2004 On Granting the Urban Okrug Status to the Municipal Formation of the "City of Kaliningrad", as amended by the Law #370 of July 1, 2009 On the Composition of the Territories of the Municipal Formations of Kaliningrad Oblast. Effective as of the day of the official publication.). Berger, Stefan "A City and Its Past. Popular Histories in Kaliningrad between Regionalization and Nationalization", in: Popularizing National Past. 1800 to Present, Edited by Stefan Berger, Chris Lorenz, and Billie Melman, Routledge 2012, pp. 288–307. Президиум Верховного Совета СССР. Указ от 4 июля 1946 г. «О переименовании города Кёнигсберга в город Калининград и Кёнигсбергской области в Калининградскую область». (Presidium of the Supreme Soviet of the USSR. Decree of July 4, 1946 On Changing the Name of the City of Kyonigsberg to the City of Kaliningrad and the Name of Kyonigsberg Oblast to Kaliningrad Oblast. ). Liuhto, Kari (editor). "Its future competitiveness and role in the Baltic Sea economic region." University of Turku. Rogoża, Jadwiga, Agata Wierzbowska-Miazga, and Iwona Wiśniewska. "A captive island. Kaliningrad between Moscow and the EU." OSW Studies, No. 41, July 2012. Wikivoyage has a travel guide for Kaliningrad.